Last fall, producers of The Simpsons got swept up in the then-hot trend of national institutions dismissing nonessential personnel out of sheer boredom, declaring that it would soon kill off one of its “regular” characters. At the time, producer Al Jean would say only that it would be a character who had appeared more than twice on the show and that its voice actor had won an Emmy for the role—knowingly leaving a huge pool of candidates, seeing as these parameters could include the dozens of characters played by all the main voice actors, as well as guest stars like Jackie Mason, Anne Hathaway, and Kelsey Grammer. But now the field has narrowed just slightly, after Hank Azaria dropped the most minor of clues in a Sirius XM interview for Entertainment Weekly’s TV Editors Hour, sending you racing to your bookie who will angrily remind you that this phone line is for betting on sports games only, not some dumb cartoon. “I honestly didn’t know who it was going to be, and now I do know… I can say that it’s not one of mine,” Azaria said, instantly sparing the lives of Moe, Chief Wiggum, Lou, Apu, Carl, Comic Book Guy, Professor Frink, Superintendent Chalmers, Bumblebee Man, Snake, Kirk Van Houten, Dr. Nick, Duffman, Cletus, Captain McAllister, Disco Stu, and many more. Of course, in addition to frustrating those who thirst insatiably for the blood of Disco Stu, it still leaves scores of other possibilities—minus Edna Krabappel (whom we already know will be "retired") and the main Simpsons family, probably. 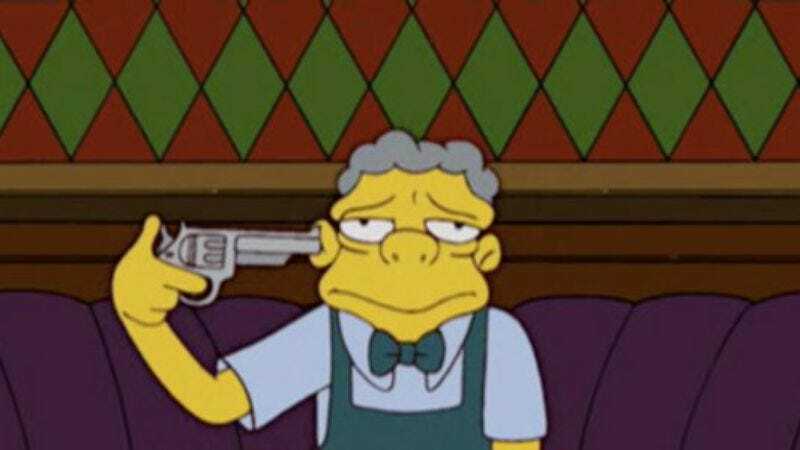 You’ll have to wait until the season 26 premiere this fall to know for sure, or just make up your mind right now that, no matter what actually happens, Milhouse is dead to you.